Country Picnics and Company Outings are now available at Swan’s Pumpkin Farm during the summer and early autumn. Our unique country setting is an ideal location for your company picnic, office outing, or family gathering. Let our friendly staff provide the food, fun, and adventure for your next group event. Available for groups of 100 to 1,000 guests. Birthday Parties or Family Celebrations can be held at the farm as well. Party barn rental for 2 hours is $75.00; bring your own decorations and birthday cake! All other food and beverages must be purchased from Swan's. The kids can enjoy a Goblin Meal which includes a hot dog, chips, and a 10 oz drink (crystal light) for $4.00 each. For the adults, try the adult party meal for $7.00 which includes a choice of hamburger or brat, chips, and a 12 oz soda; or have the adults purchase food on their own from the Cauldron Cafe. The group rate for the Adventure Wristband is $8.00 (with rental of the barn). Wristbands without rental of the barn is $10.00. The Adventure Wristband includes unlimited access to the hayride, Witch Hollow Maze, Wanda's Spook house, the Barrel Train ride, pedal karts and the new BIG GREEN SLIDE. 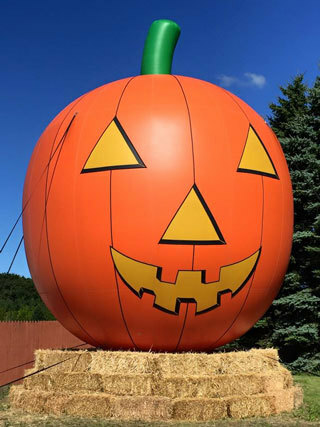 A complimentary wristband and small tour sized pumpkin is included for the birthday child with the rental of the barn. All adults will require wristbands or they may purchase individual tickets for each adventure if they desire to go along with the children. You can also add on a small school tour sized pumpkin for the birthday guests for $1.25 each. There is a $75.00 deposit required to hold your date and time, the remaining balance can be paid on the day of the party.